Increasing demand for targeted therapies, and more specifically for antibody drug conjugates in oncology, finds its scientific rationale and answers a high medical need : being able to deliver in a selective manner a cytotoxic drug into tumoral cells, with the promise to avoid healthy ones, by using specific targeting scheme of antibodies, let us imagine a more efficient and less devastating strategy than chemotherapies. This sector is in full swing and has so far no fewer than 79 molecules in clinical phase including 23 new ADCs entered clinical phase in 2017. 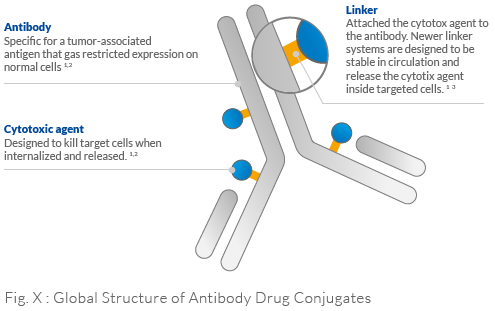 In spite of their incredible growing success, each ADC presents main drawbacks inherent to its structure, more complex and heterogeneous than the native antibody. 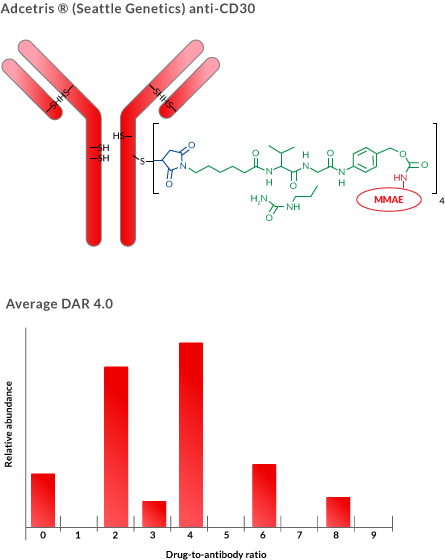 Beside possible decline of selectivity once the coupling site is not controlled – and could interfere with specific recognition scheme of the native antibody – it is also important to control the Drug to Antibody Ratio (DAR). If not, the resulting entities in a complex mix of structures, would lead to a possible lower therapeutic index, and a complex PK/PD profile, difficult to reproduce. In the specific case of Adcetris & Kadcyla, the DAR is not controlled, and competing technologies leading to both site specific and DAR control of resulting ADCs are rare. In this context, our team has set-up a new process to generate homogenous ADCs, by selective synthesis, which allows to control both the coupling site in a specific manner, but also the DAR, without modifying the antibody’s native structure. This process, which has been patented, is quite simple to set-up and robust in terms of reproducibility. 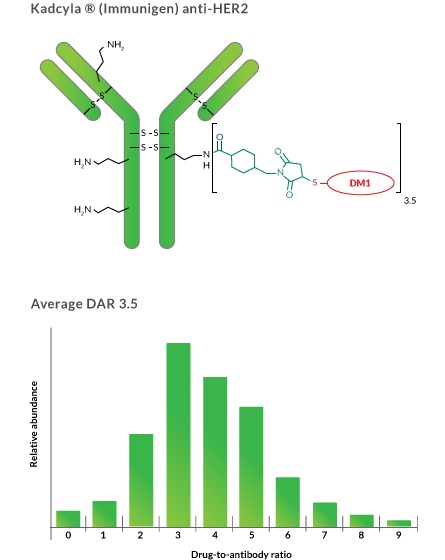 It allows the production of homogenous ADCs with a DAR control of 2:1 or 4:1 antibody/toxin ratios, in minimum synthesis steps. > Nouveaux conjugués anticorps-médicament et leur utilisation en thérapie. Joubert, N ; Viaud-Massuard, MC ; Respaud, R. Patent. WO2015004400A1.